What is that you would be looking for in a gas grill that you want to buy? Some might want a grill that offers the convenience to cook food for many people at a given time. Some would want the gas grill to have a primary grilling space apart from the regular grills. There are some who would want the grill to come with electronic ignition and also have a maximum area of cooking space. If you thought that it is difficult to find all these features in a single gas grill machine, then you need to think once again. The Char-Broil Classic 4-Burner Gas Grill is the grilling pro you can use in your outdoor space to cook food for large families. It is the best grill to suit cookout enthusiasts and it brings a lot of things to the table as far as an outdoor cook is concerned. This decent and attractive looking grill will give a new lease of life to your outdoor parties. It can cook food quickly for your guests and they will enjoy the best-flavored meat, veggies, and poultry that you make using this grill. It can be easily moved from one place to the other as this grill is mounted on wheels. The amazing features that the Char-Broil Classic 4-Burner Gas Grill offers are given below. The Char-Broil Classic 4-Burner Gas Grill is a very decent grill that you can buy under $300. It offers plenty of features that make it a very good choice for people who love cookouts. There is no better machine to use for BBQ parties in your pool area, backyards, patio areas, etc. All the four burners of the unit have individual controls. With a large cooking space of about 660 square inches, you can easily cook food for large families. It also comes with a lidded side burner to make sauces for the BBQs. This gas grill reduces your cooking time and helps you to cook food quickly and properly. The porcelain coated grates make the unit highly durable and cleaning of the spillovers and meat juices that are on the grates is very easy. The four burners are made of stainless steel and hence will last a long time. The Char-Broil gas grill with four burners is a very good option for anyone who loves to conduct BBQ parties at home for friends and relatives on most weekends. It makes cooking meat and other stuff a breeze and helps you in serving hot and delicious food for your guests at all times. To judge the quality and performance of a product, it has to be compared with two other similar products. We compare the Char-Broil classic 4 burner gas grill with two other products in the same price range of under $300. 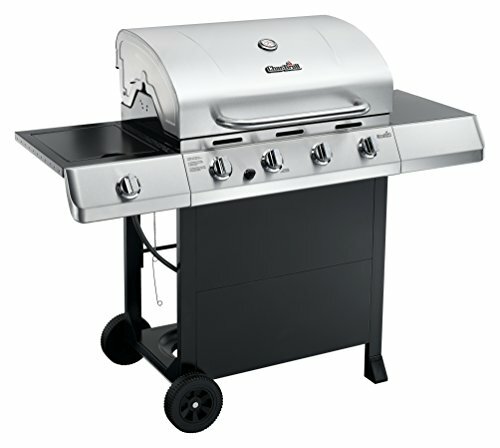 The first gas grill is the Dyna-Glo DGB390SNP-D. It is a compact looking 3-burner gas griller that is seated in porcelain enameled steel box. This machine delivers a total of 36,000 BTUs and has only 503 inches of cooking space. This unit is costlier than the Char-Broil 4 gas grills and also lacks in the number of burners, side warming plates and the BTU power. The second gas grill is the Weber 46110001 Spirit E210 that works on liquid propane gas. It carries a very heavy price tag of more than $100 than the Char-Broil classic 4 gas burner model. This unit comes with just 2 stainless steel burners and they put out 26,500 BTU an hour. This unit has a stainless steel casing, an electronic gas ignition button, porcelain coated grates and easy maneuverability options that are on offer in the Char-Broil classic gas grill also. But, the Char-Broil gas grill is a better option because it offers 4 stainless steel burners, larger cooking area and also more foods can be cooked at any time. There is no doubt that the Char-Broil 4-burner gas grill will make a great addition to any outdoor cooking area. The grill comes with a sturdy design and good looks to make it an attractive piece in the outdoor space, be it a poolside or backyard or the lawn area. The unit has 4 stainless steel burners that come with 46,000 BTU’s of power and also a cooking area of 660 square inches. Moreover, there is also a lidded side burner that can be used to prepare sauces and other foods. The unit has a porcelain coated grates that will spread heat evenly and efficiently and also will help in the quick cooking of meats and other foods. Many of the users have rated this product as the best when it comes to cooking options for outdoor space. The gas grill is fitted with heavy duty twin wheels so that it can be moved easily to any place in your outdoor area. It is far better than many of the other popular gas grillers you find in the market today. The Char-Broil 4-burner grill is a very powerful barbecue grill that can cater to small and large parties easily.